The mission of World Trout is to identify individuals and groups that protect native fish, tell their story and support their conservation efforts. Since its inception in January, 2005 (through March 31, 2007), anglers purchased 41,612 World Trout t-shirts and raised $208,060. 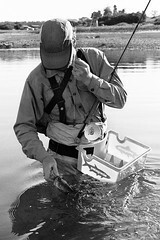 World Trout supporters have also been seeking out grassroots groups to donate funds and volunteer their time. Patagonia plans to continue the World Trout efforts which help provide funding for groups who protect fish and enhance natural habitats. Help support grassroots groups in your local areas (fresh and saltwater) by volunteering your time and/or providing financial support. 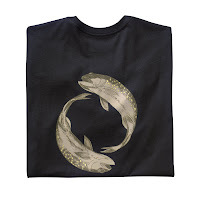 In the case of World Trout, simply buying a limited edition, organic cotton t-shirt can help protect species at home and around the world. Click on the bold text to learn more. Visit a Patagonia Dealer or Patagonia Retail Store near you. Click here to watch a short video on artist and World Trout co-founder James Prosek. It's really wonderful to see World Trout get some legs... A future vision for the initiative, in my mind, would be to sponsor graduate student work overseas... Send a fisheries student, or otherwise, to Morocco, let's say, to search out native populations of trout but also help find someone on the ground who can start a group capable of receiving World Trout money and doing something beneficial with it. Part of the difficulty, outside of the US at least, has been finding groups to give money to... In the case of the Balkan Trout Restoration Group— which has been a great success in helping educate locals in Croatia, Bosnia, Serbia, and Montenegro about the very individual, strange, and endangered trout that live in their streams, and mobilizing locals to take pride in and protect these fishes—the recipient has been a concerned professor at the University of Ljubliana, Slovenia whom I met years ago, named Ales Snoj. But without Ales, who has devoted a good part of his life to studying marbled trout and softmouth trout, we would have no organization and no way of supporting anything over there. What I mean to say is, that identifying a group to give money to can be difficult... Help in finding such individuals and groups is welcome!